The good news was that the area waters were finally down and in good shape on Wednesday and Thursday. The bad news is that the didn't stay that way I rode over to Bowden this morning and it sure doesn't look like the photo right now; it is high and colored. There were very few fishermen present and that is nearly unheard of on a warm April weekend day. The only fisherman that had any success was an Osprey at the hatchery. I was watching it as another cloudburst let go. I am sure that most other streams are as bad or worse than Shavers Fork at this time. More storms are on the way for tonight and tomorrow. Turkey season opens on Monday; therefore we all-ready know that it will rain most of next week too. Good luck to those trying to find a decent spot to fish over the next few days. I am just hoping to now get a chance to go a couple of times; before everything dries up. It is now officially Spring. The Ruby-throated Hummingbirds arrived here on April 20 and the first batch of morels and asparagus were picked and consumed on April 21. I have never been one to get excited about the generic Spring in March. But, these are the signs that I wait for. Happy Spring !! The butterflies are beginning to fly; between the rainstorms. 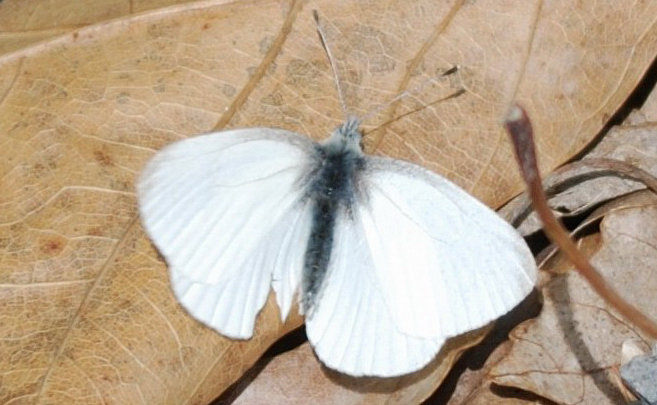 I saw a West Virginia White along the Shavers Fork on Monday. I saw my second Eastern Tiger Swallowtail of the season yesterday. Of course, the Cabbage Whites are patrolling the barren garden plots. The hardy angle-wing species have been visible for almost a month. A little blue butterfly sailed by me in the wind on Sunday. I guess that it was a Spring Azure. Now is a good time to prepare for new discoveries of Spring. I celebrated an anniversary this weekend ! I have been calculator free for one full year. Over the past few decades, I had noticed that even simple math had become difficult to do; when the trusty calculator wasn't available. Yes, that necessity of life which we have became dependent upon; since the early 80's. Last year, while doing my taxes, my calculator started spitting out some strange results. The first thing that popped into my mind, was a trip to town to purchase another. Proudly; I did not and it hasn't been missed. Simple calculations once again became something which could be quickly done; in your head. It took a little time, before I quit triple checking everything. But, in time it all comes back. I Promise. We never really know what opportunity may arise; when we are in the real world. This morning was bright and extra windy. I was outside, changing oil in my truck and happened to notice several Purple Finches. The numbers soon swelled to eighteen or more; so I went inside for the camera. The finches didn't cooperate very well and the wind didn't help matters. At one point, I had 8 males Purple Finches in the viewfinder at the same time. The bad thing about this is that they were about twenty-feet high; in the top of a violently swaying beech tree. I ended up taking about twenty photos of the finches; hoping for that one good shot. It never happened and all of the finch photos have all ready been deleted. But; as things happen in the real world, this chickadee lit beside me hoping for some relief from the relentless wind. A White-breasted Nuthatch did the same thing a few minutes later. 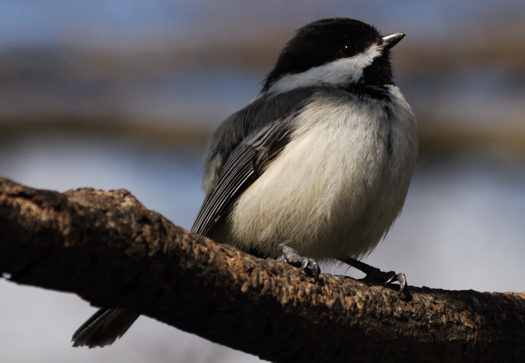 I had several chickadee images in my collection, none are better than this chance encounter. This photo is unaltered, nothing was changed; except for cropping out the background. 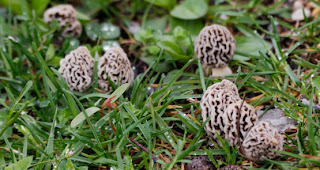 The morels; which come up in my yard every year, emerged on April 12. My first asparagus shoots popped up, later in the afternoon of the same day. A Ruby-throated Hummingbird was reported in the Charleston area today. Everything is right on schedule. It will officially be Spring for me; when my first hummingbird arrives. I already have a nest with 3 new doves. I plan on getting my ramps on Friday or Saturday; after the ground dries out some. 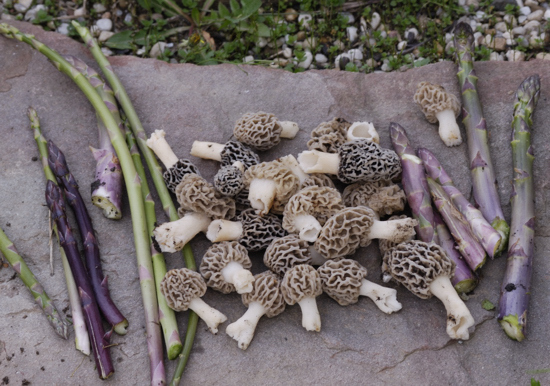 It doesn't get much better than welcoming in springtime with fresh ramps, morels and asparagus. You tend to smell pretty bad; but it is worth it. The bluebirds are building their nest in one of my nesting boxes and the tree swallows are carrying goose feathers into the other one. I haven't seen; or heard the house wrens or catbirds yet. But they will arrive any day now. Hopefully; this is good bye to another West Virginia Winter !! My yard doves hatched today. 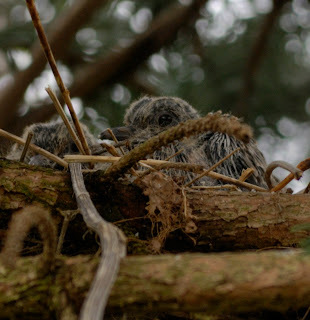 There are 3 in the nest, it is amazing that they were able to make it. This is a very flimsy nest and we have had some pretty severe weather over the last 2 weeks; while these eggs were being incubated. I believe that an agreement was reached this morning; between the feuding tree swallows and bluebirds, of my yard. The tree swallows took over the nesting box that the bluebirds had chosen and the bluebirds moved to the nest box in the upper end of my garden. I think it was a good compromise, because the tree swallow seemed as if it may be one which was raised in the same box last year. On the day that the swallows left; last June, there were 2 adults and 3 young. When the tree swallows came back in March; there were 5. The annual bird wars normally last; until a house wren moves in and takes over during the feud. The bluebirds are usually the one that gets left out and moves on. The Mourning Cloak (Nymphalis antiopa antiopa) is usually the very first butterfly species that we see as Winter is making its retreat. These big, dark butterflies can sometimes be seen; when snow is still on the ground. The adult butterfly actually hibernates in our region. It uses hollow logs and trees for hibernation. Other members of the angle-wing family do the same. The Question Mark, Eastern Comma, Gray Comma, Green Comma and Compton Tortiseshell are also hibernators. Members of this family of butterflies can be found along roads and woodland clearings. They feed on rotting fruits, tree sap and wet mineral soils. 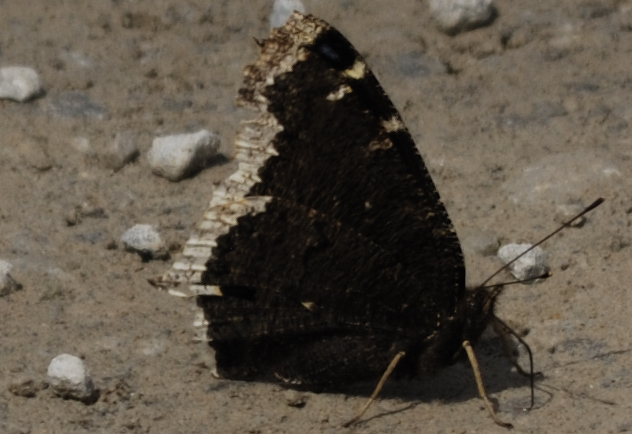 the first Mourning Cloak that I saw this year was on March 20, on Shavers Mountain. I saw one last year on the Dry Fork above Harman in early March. The preferred host plant for the larvae is Black Willow and Weeping Willow. 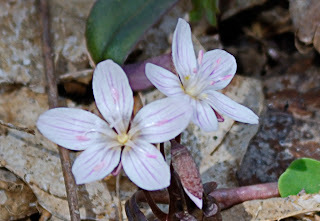 The Carolina Spring Beauty (Claytonia caroliniana) is one of the first wildflowers of the spring woodlands. It grows in rich, moist woodlands; throughout our region. The Carolina Spring Beauty has oblong leaves; while the Spring Beauty (Claytonia virginica) has elongated leaves. Both are common in our area. This image was taken at the Rich Mountain Battlefield in Randolph County, WV. I hate to drive anywhere on a warm, rainy Spring night. I usually get that bad feeling in my stomach; that same bad feeling that I get when I see other injustices which I am powerless to fix. I am speaking of the masses of squished frogs, toads and salamanders on our highways and byways. Actually the flattened ones are not as bothersome as all of the broken up and mutilated ones trying; with all of the power left in their dying bodies, to reach their breeding grounds. When possible; I find myself slowing to a crawl and weaving around the visible amphibians. I have been most anywhere that you can get to; around here. Believe me when I say that there isn't any destination that you need to be in a rush to get to. They always say to stop and smell the roses. I am now saying to slow down and enjoy the toads. They need your help and consideration. Many people; when behind the wheel see nothing. Some are observant and see everything around. Many of these things would bring joy and satisfaction to others; if they would only take the time and give it a chance. Just slow down, give the wonders of nature a chance for survival; you will be rewarded. Dedicate a single row of your gardening efforts this summer to help improve the quality of life for West Virginia’s homeless, disabled, financially struggling, and honored senior citizens. Just One More Row can make a big difference. The current recession, with the skyrocketing cost of food and fuel, has made it increasingly difficult for many members of our West Virginia community to meet their needs. You can help by participating in the One More Row food drive. But, the time to do so is NOW. We are seeking farmers and hobby gardeners from all across the state to make one simple pledge. Help alleviate hunger in West Virginia. When you plant your garden this Spring, please commit to planting just one more row of vegetables, fruit, or herbs. Then, donate that share of the harvest to others who are in need.